Ucom continues the summer fantastic price fall campaign. This time the prices for Samsung J and S-class models have dropped sharply, including those for the models produced in 2018. «Over the past month we have revised the prices of more than 100 models. 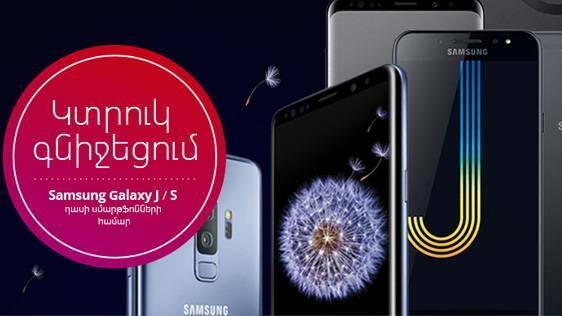 In the nearest future we are not only going to make sharp decreases of the prices, but also introduce an exclusive range of the latest smartphones to our customers. As a customer-oriented company Ucom does everything so that our subscribers with different preferences and possibilities find the most optimal option for themselves», said Hayk Yesayan, the Co-Founder and Director General at Ucom. Let us remind that Ucom subscribers can acquire the latest smartphones with warranty and post warranty service at any time. The smartphone features can be found at Ucom internet shop: shop.ucom.am.